Enhance the look of any location! Create better first impressions with the modern, sleek and attractive Smoke Stand smokers post. Keeping office buildings, airports, banks, shopping centers, automotive dealerships, universities, sporting venues, downtown shops and more clean from unsightly cigarette waste. The Smoke Stand fire safe smokers post are built from durable aluminum and steel. 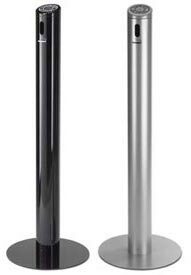 Convenient easy height of 41" encourages cigarette waste disposal. The all-weather powder-coat finish prevents cigarette burn damage.